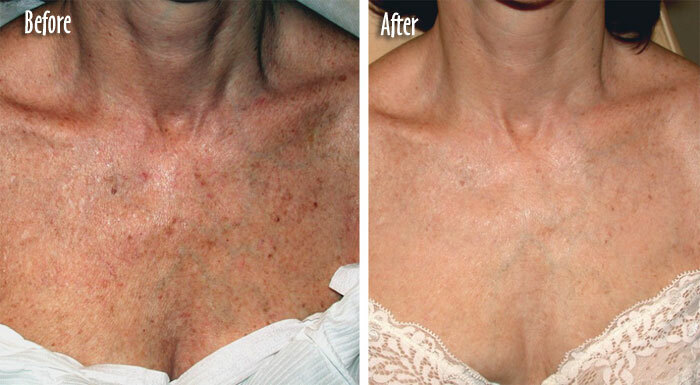 Laser treatment of Skin vascular lesions has progressed significantly over the past 25 years. Based on the pioneering work of Anderson and Parrish in the early 1980s, several vascular-specific laser systems have been developed using principles of selective photothermolysis, a concept well understood at Castleknock Cosmetic Clinic Dublin. Laser beams can selectively destroy specific targets pigment within the skin by using an appropriate wavelength, pulse duration, and energy setting. Because the energy deposited in the tissue is limited to targeted vascular lesions, significant thermal diffusion to adjacent skin is prevented. Unlike early lasers, modern systems, such as the 585-nm or 595-nm laser have become the mainstays of therapy for both congenital and acquired vascular lesions. These lasers offer excellent clinical improvement with a low risk of adverse events. Transient redness is the most common adverse effect of 585-nm laser treatment. Thanks to technological improvements including dynamic surface cooling and extended pulse duration, which enhance clinical results and minimize adverse effects. Skin vascular lesions are categorized according to pathology and age of onset. Congenital lesions begin in infancy and include port-wine stains, haemangiomas, venous malformations, and lymphangiomas. Acquired lesions develop in persons of any age and include telangiectasias, cherry angiomas, pyogenic granulomas, venous lakes, poikiloderma of Civatte. Acquired lesions may occur spontaneously, or they may be caused by trauma, ultraviolet exposure, or hormonal changes. At Castleknock Cosmetic Clinic we treat all acquired vascular lesions. Telangiectasias are small, dilated vessels that are 0.1-1.5 mm in diameter. Telangiectasias commonly occur on the face and lower extremities and are due to a variety of causes. Facial telangiectasias can occur spontaneously, or they can be caused by excessive ultraviolet exposure, collagen-vascular disease, acne rosacea, pregnancy, alcohol or estrogen ingestion, or topical corticosteroid application. Children frequently develop small facial telangiectasias that persist into adulthood. Lower extremity telangiectasias are more common in women and may be genetic or may develop after pregnancy. Treatment options are numerous and include sclerotherapy, electrodesiccation, lasers, and intense pulsed-light therapy. Shorter laser wavelengths have been found to be more effective for treating redder, more superficial vessels, but these parameters are not as successful for deeper blue venulectasia and reticular veins. The 1064-nm Nd:YAG laser has been shown to successfully improve lower extremity leg veins, especially blue venulectasia and reticular veins up to 4 mm in diameter. In one study, nearly two thirds of the patients achieved 75-100% clearing after only one laser treatment. When sclerotherapy with 0.25% sodium tetradecyl sulfate was compared with 1064-nm Nd:YAG laser therapy for lower extremity telangiectasias (0.1-1.5 mm), significant clinical improvement was seen in all sites with either modality. However, earlier clearing and higher average improvement scores were seen with sclerotherapy. Both modalities were associated with pain and localized tissue erythema and edema. Temporary postinflammatory hyperpigmentation was seen only with sclerotherapy. Despite recent advances in laser technology and the effectiveness of lasers for facial telangiectasias, treatment of lower extremity telangiectasias with vascular-specific lasers can be ineffective. Treatment failures are often attributed to the larger size and deeper site of lower extremity vessels and their association with deeper, feeding venous plexuses. For these reasons, sclerotherapy is considered first-line treatment for most telangiectatic leg veins. Cherry angiomas are small, well-circumscribed, bright-red vascular proliferations that initially appear in early adulthood and increase in number with age. Although benign, growths are easily treated with vascular-specific lasers to improve cosmetic appearance. 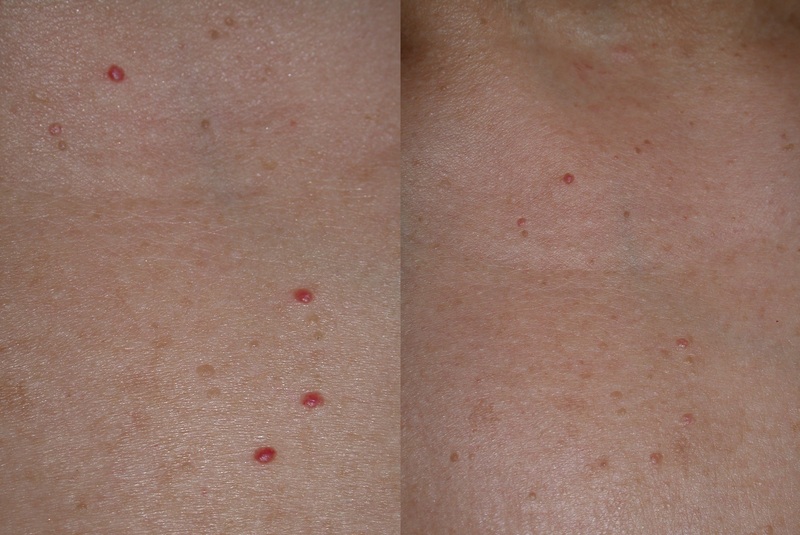 Poikiloderma of Civatte clinically appears as a reticulated, brown pigmentation of the neck, anterior chest, and lower face with prominent telangiectasias caused by chronic sun exposure. 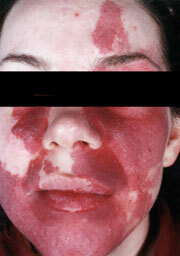 Poikiloderma may be successfully treated with either the PDL or an intense pulsed-light source. The intense pulsed-light source may prove more helpful in eliminating associated hyperpigmentation because of its additional effect on epidermal melanin.